Grilled Ahi Tuna with Oriental Sauce Recipe is a great company dish that is easy to prepare ahead of time with just a few last minute garnishes. It is appealing to the eye, very flavorful, and light. Serve with a do ahead Orange Zested Wheat Berries Salad and Oven-Roasted Asparagus, drizzled with walnut oil, and lemon zest. This delicious Grilled Ahi Tuna recipe, comments, and photos were shared with my by Karen Calanchini, Food Stylist and Photographer, of Redding, CA. To prepare Oriental Sauce: In a medium-size bowl, combine horseradish, soy sauce, chile garlic sauce, sherry, sesame oil, and ginger; whisk until well combined. Taste and adjust seasonings, if needed, to your taste. Set aside. Salt and pepper tuna steaks to taste. Brush tuna steaks with a little of the prepared oriental sauce. 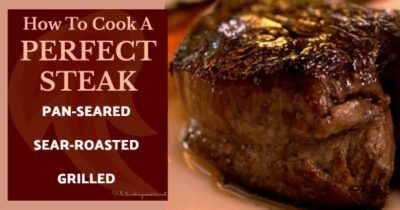 Place the marinated tuna steak over direct heat, and cook only until grill marks form, approximately 3 minutes per side. As soon as you see grill marks on the tuna, turn the tuna filet over and move the tuna to indirect heat. Do not overcook the tuna or the meat will become dry and lose its flavor. It will have a white ring around the edges, but the center will be very pink when done. Remove from grill.